With its grainy look and diluted colors, Collateral isn’t necessarily the best showcase for Blu-ray’s high-definition picture, but the video is sharp, with every piece of Tom Cruise’s gray stubble showing. And the high-def sound does a good job with the cracking bullet fire and crunching bones. Director Michael Mann’s 2004 crime movie, which was shot on high-definition video instead of film, stars Cruise as a hit man who flies into Los Angeles to fulfil his contract to kill six people. 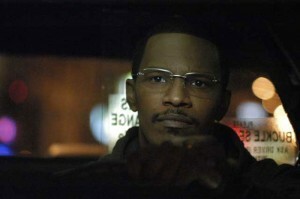 He hires a cabbie (Jamie Foxx), who becomes Cruise’s unwilling accomplice for the night’s killing spree. The movie, which also stars Mark Ruffalo and Jada Pinkett Smith, is the highlight of the package, with its flying bullets, fight scenes and plenty of tension. The special features are the same as those on the DVD, including commentary by Mann, a deleted scene with commentary and a bunch of featurettes. Other than the usual praising of fellow actors and director, the making-of featurette “City at Night” delves into some interesting parts of the production, such as Pinkett Smith telling us that Mann took her to see a couple who he said could have been her character’s parents. Mann offered Cruise similar background research for the actor’s hit man, showing him the places where the character would have grown up. There’s also an interesting short on the visual effects, with Mann explaining his motivation for the images in the windows of the train in the climactic scene. Cruise and Foxx are shown rehearsing in one featurette, and in another, Cruise is shown trying to be a FedEx delivery man at a market without getting recognized. Mann says it’s Cruise truly playing someone else. Ok. The disc also has some hidden Easter eggs, which are basically just more rehearsel or shooting footage, but with the interactivity that Blu-ray allows, do we really need Easter eggs anymore? Strangely enough, DreamWorks and Paramount didn’t use Blu-ray’s interactivity to its fullest in this release. Viewers can’t access the special features from the menu that pops up while the movie is playing. Instead, viewers have to leave the movie and go to the main menu page to get to the special features. There’s also no picture-in-picture stuff. It’s pretty much the DVD on Blu-ray. Worth the extra bucks? Depends on how much you love Mann’s movie.